Hello to all who venture here. As is natural over the course of time, all things change. Due to this I must let you know that I am no longer in the nursery 'business' in any way at all, and have returned to simply being a 'cactus enthusiast' or collector. I am and will remain I'm sure very passionate about wierd plants: but I no longer sell them. Some of you may have care sheets you received with recent cactus purchases at High Desert Market, and have come here looking for information because this web address is on these and so is my contact info. This is due to the fact that I gave the current cactus vendor (an agent, not a grower) some of my sheets and told them they could use the plant info., but that they must remove any references to me. However as of this writing they haven't done this. If you have one of these care sheets please be aware that I will leave this website up as a resource, but please DO NOT phone or eMail me: I am no longer selling plants, and take no responsibility in any way for the plants being sold at High Desert Market now. As stated above, I will leave this website up as it currently stands, but will not be updating it in any way. This includes the links page, which had some valuable plant resource pages on it; however we all know how web addresses come and go! The links may no longer be good. But some fo these addresses, such as the ADA and UofA sites, should be valid forever, I would think! Thanks for coming by anyway - Good luck with your wierd plant endeavors! I am, as some of you know, a professional sci-fi and fantasy illustrator. 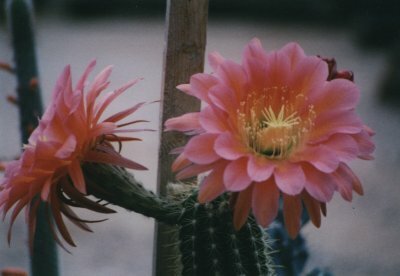 Use the links at left to go to the pages on the Sonoran Desert and desert plants. Water in the Desert - such a precious thing! 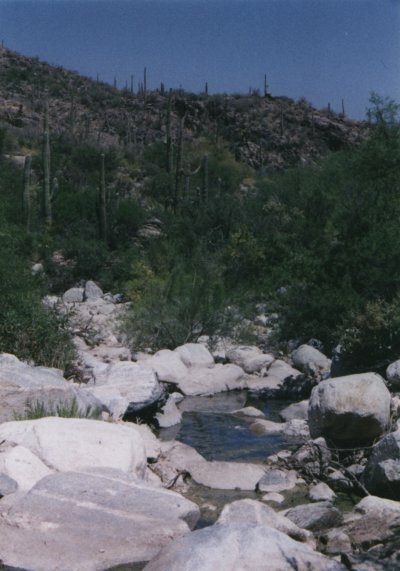 Here's a view looking up Ventana Canyon via it's creek; in the Catalina Foothills, north of Tucson.